Topic: Leadershift by Orrin Woodward and Oliver DeMille – a recent publication of the Hachette Book Group. Leadershift is a wonderful little book that should inspire all who decry the current human order and aspire to be participants in forging a new society that delivers peace, prosperity and freedom. These are worthy goals and I applaud them unconditionally. Also, I am impressed with the level of historical and analytical scholarship with which these authors inform their readers – both in this book and in others that each of them has written. They really do their homework, as they gather, organize, analyze and present relevant information concerning their topic. I know of none better. I must also point out that the authors of this book are men of action. I have personally seen them on a stage before an audience of 15,000 admirers. Their speeches stir the hearts of those present, and I’m sure by now their “following” includes at least 100,000 men and women – and possibly many more. It is for this reason that I’m writing this review – as a critique of what I perceive to be a critical error in the conclusions drawn by the book’s authors. Given their popularity and potential to influence others, I feel compelled to provide a little corrective feedback to those who might listen. Since November 1, 2011, I have been attempting to arrange a meeting with Mr. Woodward and his business partner Chris Brady – but thus far I have yet to succeed. So I’m fearful that their organization may become too bureaucratized to reach its ultimate goals. And I’d much rather see them succeed. Bureaucracy, a common feature of hierarchic organizations, is the systematic elimination, destruction or avoidance of corrective feedback – and as such plays a major role in destroying the efforts of well-meaning men and women of action whose goals are much to be desired. So it is in the spirit of caring support that I’m offering the feedback contained in this article – in hopes of seeing the authors modify their plan of action in a way that will lead to their ultimate success. “We need a nation of citizens who are leaders”, says the principal character, David Mersher to himself, just 5 pages into the story. Mersher is a successful business consultant who specializes in corporate “turnarounds”. And with this brief statement he establishes a template for what is great about this book – and for what is not. Recognizing that our government is not meeting the needs of the nation’s people and framing that fact as the consequence of inadequate leadership is brilliant. And, as the story unfolds we see Mersher doing what he does best – leading. He gathers about himself a cadre of competent successful people who jointly undertake to initiate a turn-around in the current evil trend evinced by the U.S. government today. In laying the foundation for this plan, the authors present a conversational explication of the history that led to the dilemma we face today – and they do this consistently in the spirit of the country’s founders. In fact, each chapter begins with a somewhat whimsical discussion among the ghosts of those very founders – most especially George Washington and James Madison, the latter of whom actually appears twice in the story as a living human, for the purpose of performing an intervention when he thinks Mersher’s plan may be going astray. It makes for a nice dramatic touch in the storytelling. As the story proceeds, the Leadershift plan is advanced and the historical context deepens with each conversation captured in print. The skill evinced in this presentation is masterful and the resulting analysis of the weaknesses in the U.S. Constitution is well conceived. Especially so is the notion that the framers of the Constitution presumed that political leadership at the local level would continue to be highly motivated and well informed – when in fact this turned out not to be so, and the consequences of this fact proved highly detrimental to achievement of the framers intended outcome. We know that at the time Benjamin Franklin had reservations about the implementation of a republic form of government, and in the eyes of the authors those doubts came home to roost. So it is that in Chapter 26 (on page 130 of 192) we are presented with Mersher’s plan (or, more to the point, the authors’ plan – I presume.) 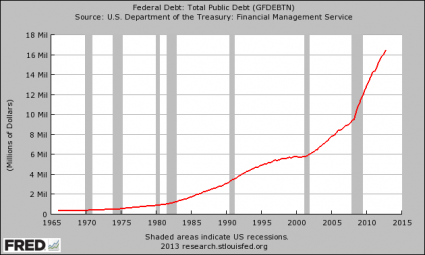 to solve the problem of the decline of U.S. government. The rest of the book details this plan and provides insights into steps that a new generation of informed local leaders can take to make our government substantially more responsive to the needs and wishes of our populace by making changes in the Constitution. The solution offered is valuable and the proposed steps may even be necessary for our species to survive – but at this point I have to maintain: this solution is insufficient, because it does not address the illusory nature of government authority. The existence of the “State”, at any level of government, is real – not a delusion or hallucination. The legitimate purpose of government is to protect the rights of the people, i.e. the public at large. A group of people, elected as legislators, can legitimately delegate rights and powers collectively that none of them possess as individuals (law making). A [government] act that benefits more people than it harms is acceptable – whereas one that benefits fewer than it harms is not (the utilitarian ethic). The nature of government (ours at least) is such that it can be altered and improved by the people. In Chapter 26 one of the book’s characters points out that at the time the Constitution was written, government was mostly a local activity and most people were involved in it on a regular basis. The significance of this fact went unnoticed – much the way a fish doesn’t notice the water in which it’s immersed – until/unless the fish suddenly finds itself removed from the water. So the framers of the Constitution took it for granted that such local activity would continue – and this was an error on their part – an error that profoundly weakened the power of the Constitution to achieve its goals long term. Similarly, I would argue that the assumptions listed above, which form the implicit background of the story, are in fact fallacious – yet so widely accepted that the authors failed to recognize the fact of their falsehood, let alone the significance of their falsehood. And further, that while the Constitutional improvements proposed in the book are worthwhile, they cannot solve the deeper problem inherent in the false assumptions. As pointed out by William Edwards Deming, referenced more than once in the book, it is very risky to modify a system in hopes of eliciting better results without a “profound understanding” of the system itself. This, of course requires that one make accurate assumptions about the system. Deming called failure to do this, “tinkering”, and warned of a variety of undesirable consequences that otherwise often attend the unstudied effort. Although he addressed this problem from a management perspective, his doing so constituted a magnificent example of leadership. And, though not often recognized, organizations that followed his advice not only became more successful, but also more creative and ethical. In the paragraphs that follow I refute the assumptions listed above, providing links to more detailed explanations where those are available. The legitimate purpose of government is to protect the rights of the people. So says the Declaration of Independence – but the statement is highly misleading. Purpose doesn’t exist in government any more than it exists in the putative state. The word, “purpose” implies motivation. Whose purpose are we discussing – those who serve and work for government? Those folks abrogate our rights more and more each day – with the passage of every new law, code, regulation etc.The sad fact is that protection of our rights has never been the purpose of government – no matter how ardently we’ve wished for it to be. A more accurate assumption would be that the purpose of government is for those who own the government to control the people at their expense – and that purely for the owners’ benefit. Our government, like most governments, is owned by the ultra wealthy central bankers, who also own the major global corporations, the prominent universities and the mass media. Their ownership is purchased via campaign contributions, school endowments, insider business tips, lender bailouts, stock option transfers, interlocking corporate board memberships, as well as by simple stock purchases, foundation grants and outright bribery.The upshot of this, more accurate, assumption is that our government is a machine – a robot that serves only its owners, and not the rest of us. A person can legitimately represent another person without that individual’s explicit informed consent. Consider this scenario. You go to your attorney and request that he attend and represent you at an important meeting that you will be unable to attend yourself. The outcome of the meeting will have profound effects on your life. What does the lawyer do? We know the answer. He draws up a very detailed contract called a Power of Attorney that specifies exactly how he is to represent you – including what he may say and what not, what you are willing to risk or give up, what you want in return, and what liabilities, if any, you are willing to undertake. And before he represents you, you have to sign the agreement – else he won’t.It is interesting to note that when that same attorney gets himself elected as a legislator, at whatever level of government, he will invariably present himself to the public as representing his “constituents” – even though most have never met him, let alone signed a power of attorney for his representation of them. It would be an understatement therefore to describe the entire concept of representational government as farcical at best – and otherwise fraudulent. Majority rule provides an ethical way of making group decisions. When a fox and a coyote take a chicken to lunch and vote on who will pay the tab, the outcome is invariably the same – the chicken gets eaten. This dynamic has been the downfall of every democracy instituted since the dawn of history. The result is known as the “tyranny of the majority”.Compound this dynamic with the elite ownership of the mass media and the schools and the result is the installation of the two party political system that is owned and operated by and for those same elites.Yet in spite of these facts, the authors of Leadershift propose fixing government by employing a strategy that includes voting based on majority rule – when in fact, we know ways of making much better, more ethical and more creative decisions than those made via majority rule. Yet this knowledge is ignored. How smart is that? A group of people, elected as legislators, can legitimately delegate rights and powers collectively that none of them possess as individuals. What would you think if you met a pair of legislators on the street and they demanded you hand over your wallet or purse to them – or face serving time in a cage? You’d call that a “mugging” wouldn’t you? It would be a crime against you – obviously.Yet that same pair of muggers can walk into the state-house or capitol and, together with their anointed accomplices, enact a tax – with the same net effect as a mugging. Even the Mafia members are more honest than that – as they operate their various protection rackets. At least they make no pretense of operating for the benefit of their victims.Yet the proposed government fix includes three taxes that everyone would be required to pay – or else. The general acceptance of assumption number 5 has many terrible consequences that go way beyond the taxation issue. These consequences bring us face to face with evil in almost every aspect of our lives. So I would challenge authors Woodward and deMille to justify acceptance of this assumption. Among these legislative rights is the right to forcibly take resources away from one person or group and bestow them upon another. The preceding section could stand alone to refute this assumption; but the matter is so important that I must call the reader’s attention to two other relevant discussions on this topic. Why Taxation Is Slavery presents three arguments against the acceptance of taxation as ethical. Ethical Means and Ethical Ends presents a more general explication of the fact that it is impossible to achieve ethical ends by unethical means. A [government] act that benefits more people than it harms is acceptable – whereas one that benefits fewer than it harms is not. This assumption, known generally as the “Utilitarian Ethic”, is readily refuted in at least 3 ways, as demonstrated in the preceding link. Yet it is generally accepted as valid by those who choose not to examine it properly – and it forms the ostensible ethical basis for government per se. As such, its acceptance constitutes a critical error in the thinking of Mr. Woodward and Mr. deMille. This assumption is partly refuted by the discussion of Assumption #2 above. For a more comprehensive discussion of the nature of government and the ethical implications thereof, the reader will find Ethics, Law & Government to be highly illuminating. The book, Leadershift, is well worth reading. It contains much that is both thoughtful and informative. And it embraces the “grassroots” principles that are largely missing in today’s world. What is more, I know enough about the authors to have immense respect for them. Mr. Woodward is building a huge leadership training organization that is without peer – potentially a great asset to the human species. In light of the falsehood of the 8 assumptions discussed in the foregoing, I must assert that the Mersher plan to fix the government is doomed from its inception. While the steps outlined in the book may be necessary to provide a just and ethical human society, they are surely insufficient. To correct the ills of society we will need to employ a strategy that is outside the box of political action. Such is the Titania Project. Unfortunately, it is all too easy for great leaders to insulate themselves from valuable feedback from outside their immediate sphere of influence. When leaders make themselves immune to such feedback, they become bureaucrats – by definition. So to Orrin Woodward, Oliver deMille, Chris Brady, and the Life Policy Council I say, this is a test. You have to choose. Are you leaders or bureaucrats? You can’t be both. Let me show you a better way to implement grassroots self-governance. Let’s get you going in the right jungle. 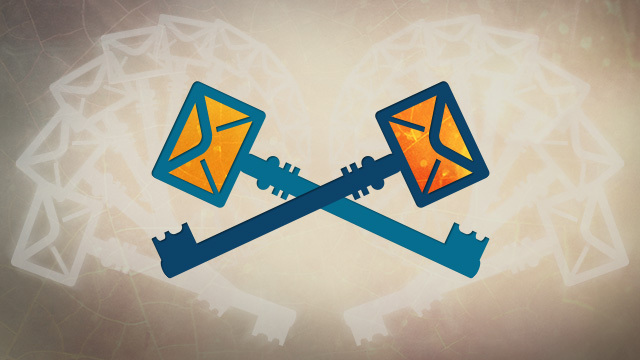 How to to encrypt e-mail, and why most don’t bother. In an age of smartphones and social networking, e-mail may strike many as quaint. But it remains the vehicle that millions of people use every day to send racy love letters, confidential business plans, and other communications both sender and receiver want to keep private. Following last week’s revelations of a secret program that gives the National Security Agency (NSA) access to some e-mails sent over Gmail, Hotmail, and other services—and years after it emerged that the NSA had gained access to full fiber-optic taps of raw Internet traffic—you may be wondering what you can do to keep your messages under wraps. The answer is public key encryption, and we’ll show you how to use it. 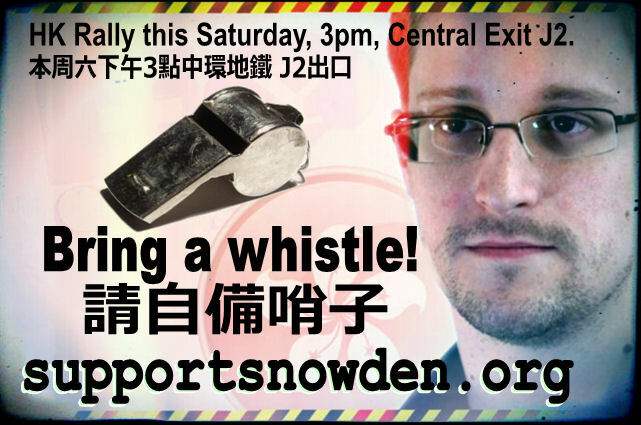 The full extent of the cooperation between the NSA and various technology companies is unclear. It will probably remain that way for the foreseeable future. For the time being, however, it seems likely that the standard cryptographic tools used to secure data “in flight”—that is to say, the SSL that protects data traveling between machines on the Internet—remain secure as long as certain best practices are used. That protects against some threats, such as wholesale monitoring of Internet traffic of the kind the NSA is known to engage in, but it doesn’t do anything to protect data that’s “at rest.” That is to say, SSL doesn’t do anything to prevent a company like Google or Microsoft from handing over an archive of your e-mail in response to a court order. The e-mails are just lying around on some Google server somewhere. If you don’t want a government, service provider, employer, or unauthorized party to have access to your mail at rest, you need to encrypt the mail itself. But most encryption algorithms are symmetric, meaning that the encryption key serves a dual purpose: it both encrypts and decrypts. As such, people encrypting mail with a symmetric key would be able to decrypt other mail that used the same symmetric key. While this would protect against anyone without the key, it wouldn’t be very useful as an encrypted e-mail system. The solution to this is asymmetric cryptography. In asymmetric encryption there are two opposite keys, and a message encrypted with one key can only be decrypted with the other. The two keys are known as a private key, which as the name might suggest is kept private, and a public key, which is broadcast to the world. Each time you want to send an e-mail to someone, you encrypt it with the recipient’s public key. Asymmetric encryption is also used to perform mail signing. For this, the mail sender encrypts a hash, or mathematical fingerprint, of their file, producing a signature. Hashes are designed so that any small change to the message’s text will produce a different hash value. Anyone reading the mail can then decrypt the signature using the sender’s public key, giving them the original hash value. They can then compute the hash value of the mail they received and compare the two. If the values are the same, the message hasn’t been modified. If they’re not, it has—and we’ll see the uses of this later on. Making things even more complex, having encryption support isn’t itself enough. To a great extent, you don’t control the things that are in your own inbox. That’s all mail that someone else has sent you. If you want your inbox to contain encrypted mail that only you can read, you need to be sure that people sending you mail are encrypting that mail when they send it. And if you want to be sure that everything in your sent mail folder is encrypted, you’ll need to send other people encrypted mail. Finally, e-mail encryption doesn’t encrypt everything. 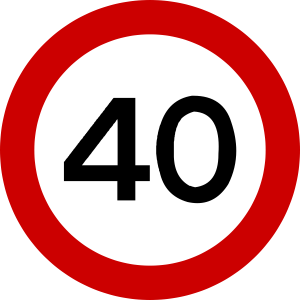 Certain metadata—including e-mail addresses of both sender and recipient, time and date of sending, and the e-mail’s subject line—is unencrypted. Only the body of the mail (and any attachments) gets protected. If you’re happy with these constraints, e-mail encryption is for you. Unfortunately, it can be complicated to use. Fortunately, free e-mail encryption programs are available for all major operating systems, and the ability to use them effectively isn’t out of the grasp of average computer users if they know where to look. What follows is a set of step-by-step instructions for using GnuPG, the open-source implementation of the PGP encryption suite, to send and receive encrypted e-mails on machines running Microsoft Windows and Mac OS X. The basic element you’ll need to encrypt mail is software to generate and manage your key pair and make them work with whatever e-mail program you happen to use. On Windows, there’s no shortage of proprietary apps that will do both, with Symantec’s PGP Desktop E-mail being perhaps the best known. There’s nothing wrong with this offering, but it’s almost $200 for a single-user license. This tutorial will instead focus on the open-source Gnu Privacy Guard, which is available for free on Windows, Mac, and Linux platforms. GnuPG, or simply GPG, is still available mostly as a command-line tool, meaning there’s no graphical interface many end users would feel more comfortable using. Rather than learn a long list of GPG commands, many e-mail users are better off installing graphical implementation of GPG. On Windows, Gpg4win will give you everything you need to generate strongly encrypted messages that can be sent and later decrypted by the intended receiver using standard e-mail programs. 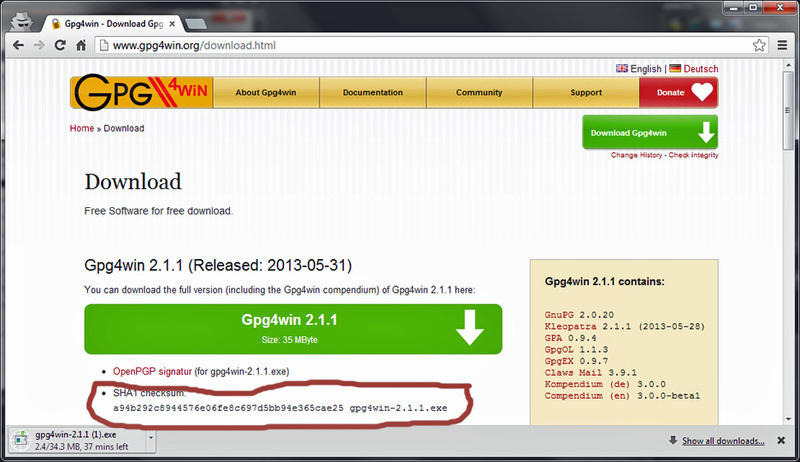 At time of writing, the most recent version of Gpg4win is 2.1.1 and it’s available here. After downloading such a sensitive piece of software you’ll want to confirm the installer hasn’t been tampered with and truly came from Gpg4win rather than a site masquerading as gpg4win.org. To do that, we’ll need to check the SHA1 checksum for the downloaded file and make sure it matches the hash—a94b292c8944576e06fe8c697d5bb94e365cae25—listed on the Gpg4win download page. For those who prefer a graphical interface, use HashCalc. Install HashCalc and then open the program. 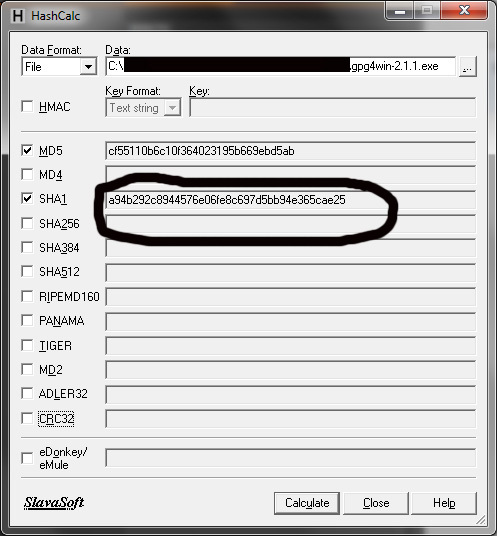 In the “data” box, navigate to the folder where the downloaded gpg4win-2.1.1.exe file is located. In our case, since the SHA1 hash calculated by HashCalc matches the SHA1 digest provided on the Gpg4win download page, we have a high degree of confidence the file we’re about to install is genuine. For readers who prefer command lines, Microsoft’s File Checksum Integrity Verifier may be a better way to check the SHA1 hashes. You’ll need to download and extract the FCIV package and follow the instructions in the readme text file, including making sure the folder containing the FCIV executable file has been added to the system path of Windows. With that out of the way, open a Windows command window and navigate to the folder containing the Gpg4win installer. Once you’re sure you have the real gpg4win-2.1.1.exe, double-click on the file and click Yes to the User Access Control dialogue. 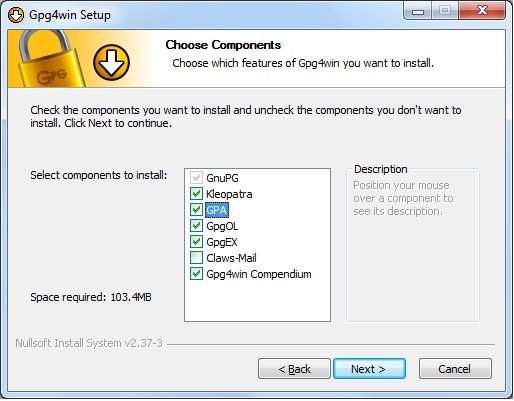 When presented with the Gpg4win installation welcome screen, click Next, and then click Next at the following window to accept the Gpg4win license agreement. The next screen will allow you to choose the precise GPG components you want to install. Make sure you install all available components, including GPA, which is short for the GNU Privacy Assistant. Click Next at the Choose Components screen and again at the Destination and Install Options screens. At the Install Options screen, makes sure the “start menu” box is checked, click Next, and at the next window click Install. We won’t be using S/MIME for now, so if you see any screens referring to Trustable Root Certificates, you can click the box to skip configuration and click Next. The installation is now complete. In the screens that follow, enter your name and e-mail address. When asked if you want to back up your key, choose “Do it later.” It’s not that this step isn’t important, but we’ll want to back up the key only after we’re satisfied that we’ve done everything correctly. Next, you’ll need to choose a passphrase to protect your key. Your passphrase is like the password protecting an e-mail or Web account. Except rather than preventing an unauthorized person from accessing your account, it prevents the person from using your private key should it ever be lost or stolen. In other words, the password is extremely sensitive. It should have a minimum of nine characters, but 18, 27, or even 36 characters are even better. For more tips on generating a strong password, see Ars Senior Reporter Jon Brodkin’s discussion of master passwords here. When you’re finished, you’ll have generated your first key pair: the public key you will share with other people so they can send encrypted messages that only you can read, and the private key you’ll use to decrypt those messages. 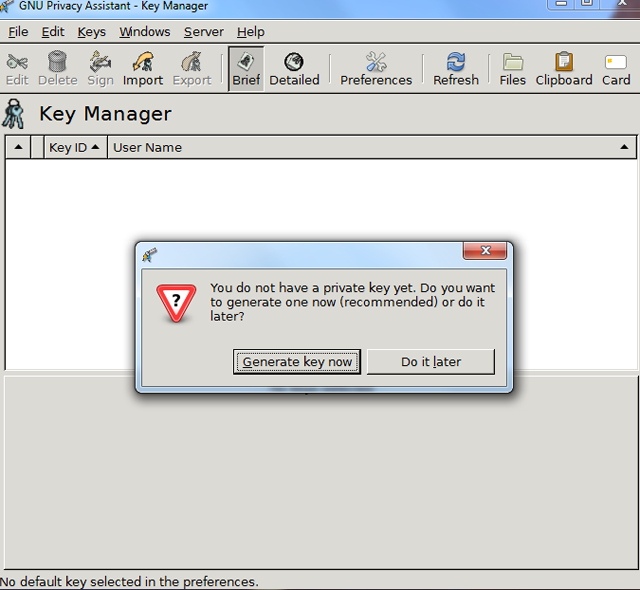 While generating your key, be sure to set an expiration date, rather than allowing it to remain valid forever. This way, keys that new users abandon, lose or never end up using won’t remain on public servers indefinitely. Remember also to backup your private key somewhere that’s extremely safe. Storing it on a USB stick that’s stored in lock box is one suitable method. You may also want to upload your public key to one or more public key servers. These servers give crypto users a way to make their keys available to others and to fetch other people’s public keys. Take the public key of a real-world contact and save it to a file named something like key.txt. 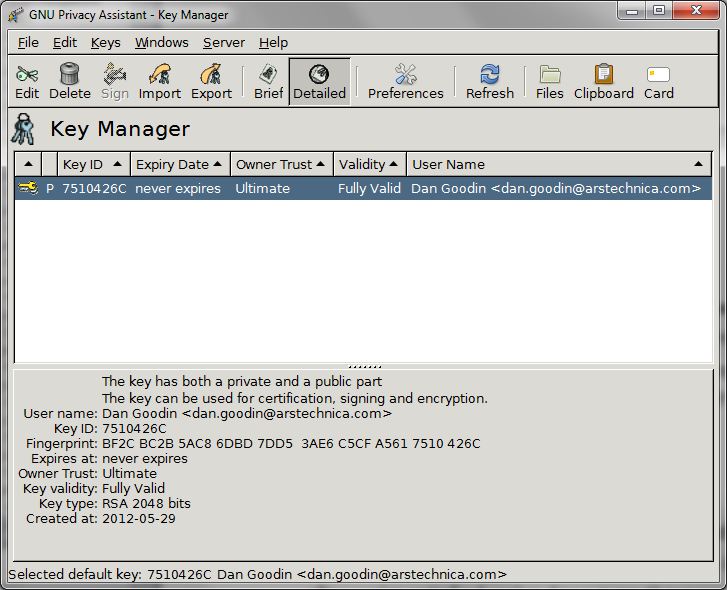 If you don’t have a real-world contact who has a public key, save the above public key to a file and name it key.txt. Now, with GPA open, choose the “Import” icon, navigate to the disk location of key.txt, highlight the file, and click Open. Congratulations. You’ve just imported your first public key. Don’t get too excited just yet. You’ll need to import a public key for each person you want to send encrypted mail to. (Reuters) – “God we trust,” goes an old National Security Agency joke. “All others we monitor. First, the Guardian reported details on a domestic telephone dragnet in which Verizon was forced to give the NSA details about all domestic, and even local, telephone calls. Then the Guardian and the Washington Post revealed another massive NSA surveillance program, called Prism, that required the country’s major Internet companies to secretly pass along data including email, photos, videos, chat services, file transfers, stored data, log-ins and video conferencing. While the Obama administration and Senate intelligence committee members defend the spying as crucial in its fight against terrorism, this is only the latest chapter in nearly a century of pressure on telecommunications companies to secretly cooperate with NSA and its predecessors. But as stunning technology advances allow more and more personal information to pass across those links, the dangers of the United States turning into a secret surveillance state increase exponentially. The NSA was so flooded with billions of dollars from post-September 11, 2001 budget increases that it went on a building spree and also expanded its eavesdropping capabilities enormously. Secret rooms were built in giant telecom facilities, such as AT&T’s 10-story “switch” in San Francisco. There, mirror copies of incoming data and telephone cables are routed into rooms filled with special hardware and software to filter out email and phone calls for transmission to NSA for analysis. New spy satellites were launched and new listening posts were built – such as the recently opened operations center near Augusta, Ga. Designed to hold more than 4,000 earphone-clad eavesdroppers, it is the largest electronic spy base in the world. Meanwhile, at Oak Ridge National Laboratory in Tennessee, where top-secret work was done on the atomic bomb during World War II, the NSA is secretly building the world’s fastest and most powerful computer. Designed to run at exaflop speed, executing a million trillion operations per second, it will be able to sift through enormous quantities of data – for example, all the phone numbers dialed in the United States every day. Today the NSA is the world’s largest spy organization, encompassing tens of thousands of employees and occupying a city-size headquarters complex on Fort Meade in Maryland. But in 1920, its earliest predecessor, known as the Black Chamber, fit into a slim townhouse on Manhattan’s East 37th Street. World War One had recently ended, along with official censorship, and the Radio Communication Act of 1912 was again in effect. This legislation guaranteed the secrecy of electronic communications and meted out harsh penalties for any telegraph company employee who divulged the contents of a message. To the Black Chamber, however, the bill represented a large obstacle to be overcome—illegally, if necessary. So the Black Chamber chief, Herbert O. Yardley, and his boss in Washington, General Marlborough Churchill, head of the Military Intelligence Division, paid a visit to 195 Broadway in downtown Manhattan, headquarters of Western Union. This was the nation’s largest telegram company – the email of that day. The two government officials took the elevator to the 24th floor for a secret meeting with Western Union’s president, Newcomb Carlton. Their object was to convince him to grant them secret access to the private communications zapping through his company’s wires. 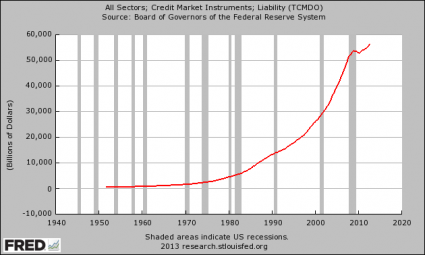 Time and again over the decades, this pattern has been repeated. The NSA, or a predecessor, secretly entered into agreements with the country’s major telecommunications companies and illegally gained access to Americans’ private communications. But when President Franklin D. Roosevelt later appointed Stimson secretary of war during World War Two, Stimson changed his mind. He wanted to eavesdrop on every possible communication, especially on the Germans and Japanese. Once the guns of World War Two began falling silent, however, the communications privacy laws again took effect. Thus, Brigadier General W. Preston Corderman, the chief of the Signals Intelligence Service – another pre-NSA iteration — faced the same dilemma Yardley confronted after World War One: a lack of access to the cables flowing into, out of and through the country. So, once again, deals were made with the major telegraph companies – the Internet providers of the day – to grant the SIS (and later the NSA) secret access to their communications. Codenamed “Operation Shamrock,” agents would arrive at the back door at each telecom headquarters in New York around midnight; pick up all that days telegraph traffic, and bring it to an office masquerading as a television tape processing company. There they would use a machine to duplicate all the computer tapes containing the telegrams, and, hours later, return the original tapes to the company. The secret agreement lasted for 30 years. It only ended in 1975, when the nation was shocked by a series of stunning intelligence revelations uncovered by a congressional investigation led by Senator Frank Church. The illegality and vast breadth of this one operation stunned both the left and the right, Republicans as well as Democrats. The parties came together to create a new law to make sure nothing like it could ever happen again. Known as the Foreign Intelligence Surveillance Act, the legislation created a secret court, the Foreign Intelligence Surveillance Court, to ensure that the NSA only eavesdropped on Americans when there was probable cause to suspect they were involved in serious national security crimes — such as espionage or terrorism. For more than a quarter-century, the NSA obeyed this law. The intelligence agency turned its giant ears outward — away from the everyday lives of Americans. But that all changed soon after September 11, 2001, when the Bush administration began its warrantless wiretapping program. Once again, an NSA director sought the secret cooperation of the nation’s telecom industry to gain access to its communications channels and links. Again, the companies agreed — despite violating the laws and the privacy of their tens of millions of customers. Eventually, when the operation was discovered, a number of groups brought suit against the companies, Congress passed legislation granting them immunity. Thus, for roughly 100 years, whenever the government knocked on the telecommunications industry’s door and asked them to break the law and turn over millions upon millions of private communications, the telecoms complied. Why not, since they knew that nothing would ever happen to them if they broke the law. Now, as a result of these new revelations, it appears that the NSA has again gone to Verizon and other telephone companies, as well as many of the giant Internet companies, and obtained secret access to millions, if not billions, of private communications. There are still many questions as to what, if any, legal justification was used. But unlike with Yardley and the Black Chamber, the dangers today of secret cooperation between the telecom and Internet industry and the NSA are incomparable. Because of technology back then, the only data the government was able to obtain were telegrams — which few average people sent or received. Today, however, access to someone’s telephone records and Internet activity can provide an incredibly intimate window on their life. Phone data reveals whom they call, where they call, how often they call someone, where they are calling from and how long they speak to each person. Internet data provides e-mail content, Google searches, pictures, and personal and financial details. We now live in an era when access to someone’s email account and web searches can paint a more detailed picture of their life then most personal diaries. Secret agreements between intelligence agencies and communications companies should not be allowed in a democracy. There is too much at risk. In a dusty corner of Utah, NSA is now completing construction of a mammoth new building, a one-million-square foot data warehouse for storing the billions of communications it is intercepting. If the century-old custom of secret back-room deals between NSA and the telecoms is permitted to continue, all of us may digitally end up there. Contrary to what Simpson may have asserted, gentlemen (and women) do read each other’s mail — at least if they work for the National Security Agency. And in the future, given NSA’s unrestrained push into advanced technologies, the agency may also be able to read your thoughts as well as your mail.